The remaining two go along with the new book (progress below), so I'll keep those under wraps until the book launch. Since The Hall of the Wood is getting a new round of editing, I think it also needs a new cover. I got two potential proofs back from my new book cover designer this past week, showcased them over on kboards to get some feedback, and got some changes back to the designer. Now, more waiting as he makes those changes and gets them back to me. Any week I exceed 5,000 words is a win in my book, so I'm happy with my progress, especially given that I continue to deal with other things like maps, covers, and editors. Such is the life of an independent author. Here's the charts and I need to go mow the lawn (and then do some writing). 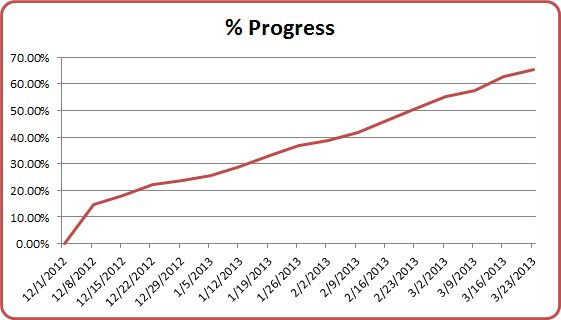 Good progress this week, plus a reset on progress in terms of percent as I realized my 5,000 words per chapter estimate was on the low side. More on that below. I'm closing in on what should be my last few map updates. I hope so, anyway. At this point I have 4 of 5 maps in hand and complete. The ones I've revealed so far include the map to go along with The Hall of the Wood, the map for The Five Elements, and the world map. Map number 4 goes along with The Nullification Engine and will be revealed as part of the book launch in a few months. The last and final map, also to go along with The Nullification Engine, is a city map. The sketch for that one is now in the hands of my capable illustrator, so I'm in a holding pattern waiting to get the first draft back. Hopefully I'll have some more news next week on this. I'm going to make an admission of guilt: The Hall of the Wood never went through the "proper" editing and proofreading process. It shows in some of the reviews, too. I've really no good reason why the book was never properly edited. I was new to the game, I thought I could edit it myself… None of which is excusable. When readers pay for something (or not, since HOTW has been downloaded tens of thousands of times for free), there should be some minimum guarantee of quality. HOTW is a book I want to remain on shelves for a long time. It has its flaws, but I think it's a good, enjoyable read. That being said, I've got a conversation going with a highly recommended editor who, if things work out, I also will hire to do the editing on this next book I'm working on now. Since HOTW is getting a fresh round of (professional) editing, I thought I'd also see about getting a new cover done up. New cover, new edit, new edition, is what I'm thinking. I'm waiting to get the first proofs back from my book cover artist, so I might have something to show or talk about in next week's update. So this is my 16th writing update since I started work on The Nullification Engine. That roughly means I've been working on the current, first draft for 16 weeks. I say 'roughly' because I actually put a lot of time into the outline prior to that. 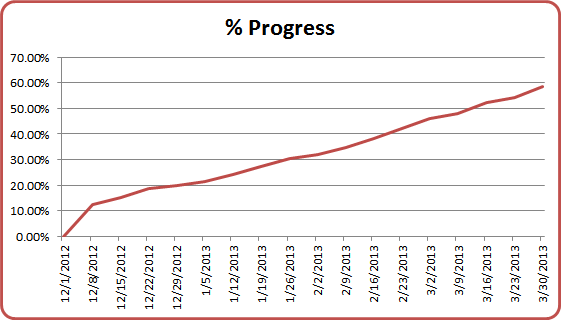 Four months in, and based on the revised numbers below, I'm just about 60% done. If you go back to last week's update, I was at 65%. The reason for the discrepancy is this: First, I made some tweaks to the outline, so I now have the expected number of chapters at 25 (down from 30 at one point). 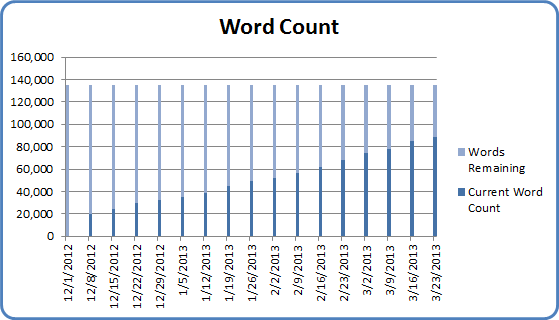 Also, I realized that my initial estimate of 5,000 words/chapter was low. 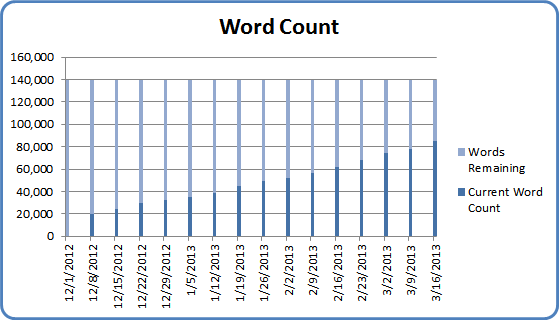 Some quick calculations revealed I'm clocking in at about 6,500 words/chapter. 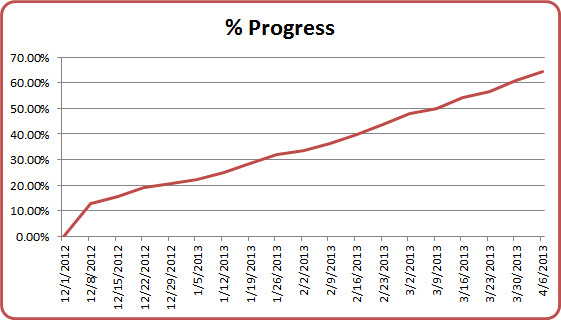 This plays into the percentage complete estimation, so now with that new words/chapter figure I'm 58.42% done. That's it from me. Kind of a long update. Now, back to writing. I had kind of a double-whammy on progress this past week. Last weekend I was out of town at one my wife’s mountain bike races (where I did some riding of my own) and then I had to actually commute into the office two days at the end of the week. Commuting into the office for me is about 2 hours round-trip, which doesn’t sound too terrible and isn’t since I did for many years, but the hours were just disruptive enough that it threw my writing schedule off a bit. That being said, I still think I did ok. See below for the writing numbers. Meanwhile, I took care of some other business as well. I did some work on what will be the fifth and last map I intend to have done. This last one is for the city of Brighton where most of the next book in The Alchemancer series takes place. Not much else to say about this other than that I hope to have the first draft of the sketch to my illustrator by next week. 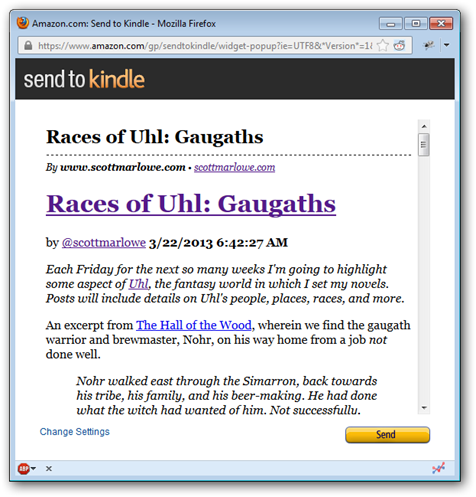 Send to Kindle – Implemented! Similar to the social buttons you often see for Twitter, Facebook, Google+, and others, Amazon now has a Send to Kindle button web developers can place on their sites so readers can automatically send content to their Kindles for later reading. The whole ‘send to kindle’ thing isn’t new, but the ease at which it works via the new button makes a big difference. It’s just too easy. Here you can see where I placed the button at the top of each post. Click "Send" and away the content goes to your Kindle eReader, cloud app, phone, etc. based on what settings you choose the first time you run through the process. It's really quite handy for 'reading later'. The sooner I report this, the sooner I can begin the next cycle and keep on writing. So, here we go. It's back to writing for me. I'm posting this a day early because I actually don't plan on being anywhere near a computer this weekend. Well, I will have my phone… and the iPad… but you get the idea. Knowing this, I tried to get as much writing in earlier in the week and last weekend as I could and I think it paid off as I wound up having my best week since I started these updates. Let's not waste any more time. Let's get to it. In case you missed it, the World of Uhl map has been revealed! I think it came out pretty good. Other than that, I have only one more map left for Jared Blando to work up for me. That last map is of the city of Brighton, where most of our story takes place in this next book. I'm still working on the sketch for that one, but it's not really a rush since I won't reveal that map or the one of the Earldom of Kettering until The Nullification Engine is released. I'm probably 3-4 months away on that, I think. I'll get right to the numbers. 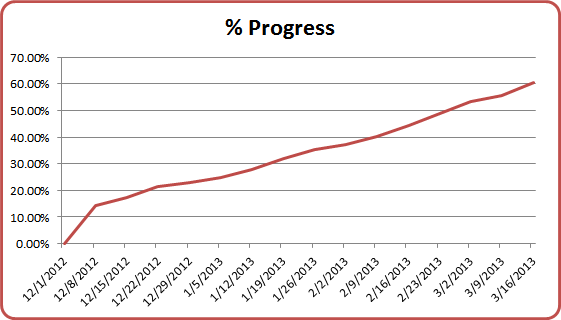 I'm over 60% complete with the first draft of The Nullification Engine, having written 7,102 words this past week. That's a new high for me so far and I clocked a nice 1,184 average words/day. Still a ways to go, but I'm getting there. Last week I was a little concerned that my mapmaker might have died or otherwise expired (undead, anyone?) because I hadn't gotten any responses from him in some weeks. Turns out his primary email was having some issues. All is well and he took care of the latest round of corrections on the world map of Uhl and the regional map for The Nullification Engine. The world map is exactly what it sounds like and therefore "spans" all short stories and novels. The regional map actually encompasses a small part of the map from The Five Elements but expands to the north as that's the direction our heroes will be taking in this next installment. I'll reveal the world map soon. The regional map for The Nullification Engine I'll have to hold onto until the novel is done. It's nice having it in hand now, though, because it makes it so much easier to refer to something in the text and know that it's set in concrete now. The beginning of this past week started real good. 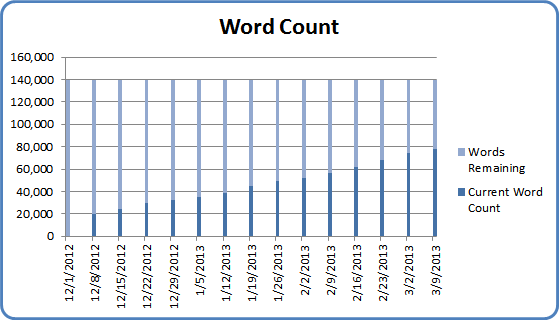 I had a 2,000+ word day on Saturday followed by a 1,000+ word day on Sunday. I did ok from there as well, but then had to travel for work (day job) in the middle of the week. I'm setup to pretty much write from anywhere on either of my laptops (work and personal) since everything is sync'ed via Dropbox, but with it only being 2 days in a hotel and with other after-hours activities going on I didn't get much done in terms of actual 'words on the page' writing while I was away. However, I did get some work done on the outline, which needed a little fine-tuning. it isn't unusual for me to tweak things as I go along even though the majority of the plot is planned out before I ever start writing. As long as the tweaks are minor then the train stays on the rails and, in fact, I wind up saving a lot of time on rewriting or even having to throw away words because I never write anything that isn't going to work or is extraneous. As part of these tweaks I also did some consolidation, so the chapter count is down to 28 from 30 now. 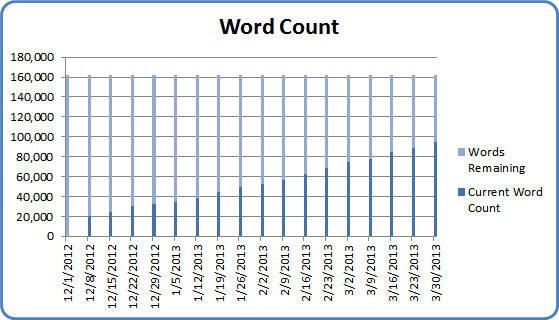 That brings my estimated total word count for the whole novel to 140,000. As for where I'm currently at, let's take a look. I'm more than halfway done now with about 62,000 words to go. 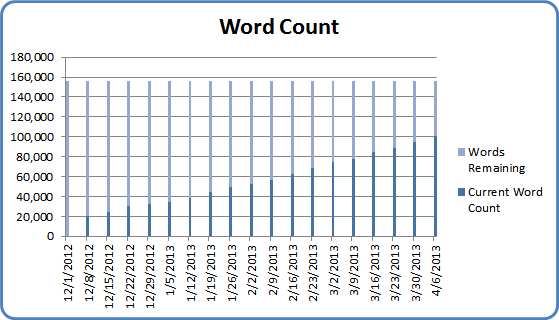 At 5,000 words per week, that's (unfortunately) another 3 months of writing. Here's the graphs and I better get back to it.